One of the largest and most populated unincorporated communities in the United States, Highlands Ranch Colorado sports a population of just over 96,000 according to the 2010 census. Located in Douglas County, Colorado, Highlands Ranch is next to the city of Littleton and has enjoyed a rich, vibrant history as being in the Denver area as well as being one of the fastest growing communities in adding over 20,000 residents since 2000. The first residents of Highlands Ranch were Native American tribes that populated the area. It was first explored by Rene-Robert Cavelier in 1682 and was declared part of the Louisiana territory. By 1803, the land belonged to the fledgling United States as part of the Louisiana Purchase. Explorers wander through the Highlands Ranch area over the next half-century, but it wasn’t until the Denver area began to settle in 1859 that a large population began to move in. Highlands Ranch was first permanently settled in 1870 and continued to grow over the years, albeit slowly as the gold rush of the late 19th and early 20th centuries in the region took hold. However, unlike Denver and Littleton, Highlands Ranch remained more a series of ranches and farms and did not grow like the other communities at the time. By 1978, the entire Highlands Ranch area had been purchased and by 1981 the first homes were built as a part of the outlying Denver area. By 1985, the area had become a very attractive place to live thanks to SH 470, the beltway which wrapped around the greater Denver area had been constructed near Highlands Ranch. While the early residents complained about the overall lack of retail development it soon gave way to the massive growth that has been occurring ever since. Today, the explosion of growth continues as Highlands Ranch fills out its space and more people are discovering the advantages of living in the area itself. 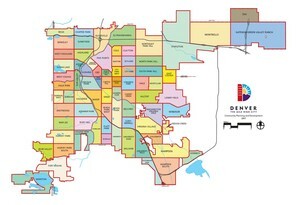 Labeled a “bedroom community” of the Denver area, many of the residents in Highlands Ranch commute either to the downtown area or the Denver Technological Center. Today, there are four recreational centers, six high schools, a plethora of retail shopping, small businesses and many different parks and open spaces that are still part of the area. Despite having a population close to 100,000, it has no police force and borrows from next door Littleton and Douglas County in general for law enforcement, street maintenance and the like. What government there is comes from three elected board members who form the Board of County Commissioners. Everything from housing decorations, fencing and even the area’s library system are all governed by this particular board. Despite being unincorporated, Highlands Ranch is still growing strong and its location has attracted quite a number of people who work in the downtown Denver area. While traffic is still a major issue, the people of Highlands Ranch enjoy their status as being one of the best communities in the greater Denver area.